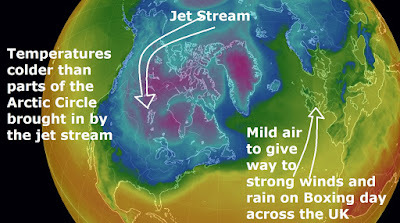 Temperatures humans shouldn't have to endure will hit parts of the US this week as the jet stream will deliver an Arctic hell and dangerous conditions with temperatures colder than parts of the Arctic Circle. 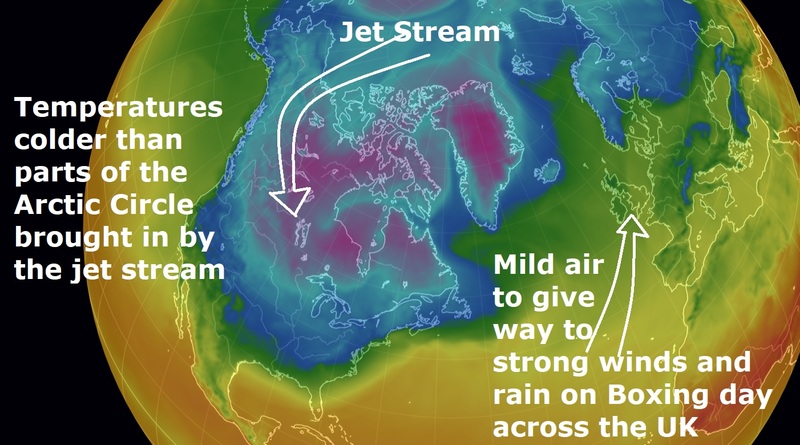 Christmas day will see a dip in the jet stream deliver an Arctic blast into the Plains and the Great Lakes. “The core of the cold will be centred over the northern Plains, where temperatures up to 20 degrees Fahrenheit below late-December normals will be common,” said AccuWeather Meteorologist Renee Duff. Much of North Dakota and Minnesota on northward into the Canadian Prairies will struggle to reach the single digits for highs through Wednesday. Cities like International Falls, Minnesota and Fargo, North Dakota will likely stay below zero degrees Fahrenheit until late week. The last time Minneapolis had a temperature in the single digits on Christmas Day was in 1985 when the high was 8. Santa sunbathes in the UK , photo Huffington post. Across the pond, the UK and western coast of the Continent have been enjoying record mild temperatures washing up from the Azores, off the coast of North Africa with parts of the UK warmer than Madrid, however, the mild weather will end on Christmas day when a cold front sweeps across the British Isles, bringing a band of rain and gusty winds to the U.K. from later Christmas day into Christmas night. According to Accu Weather, in the wake of the front, chillier air will bring temperatures back to more seasonable levels throughout the U.K. for Boxing Day.